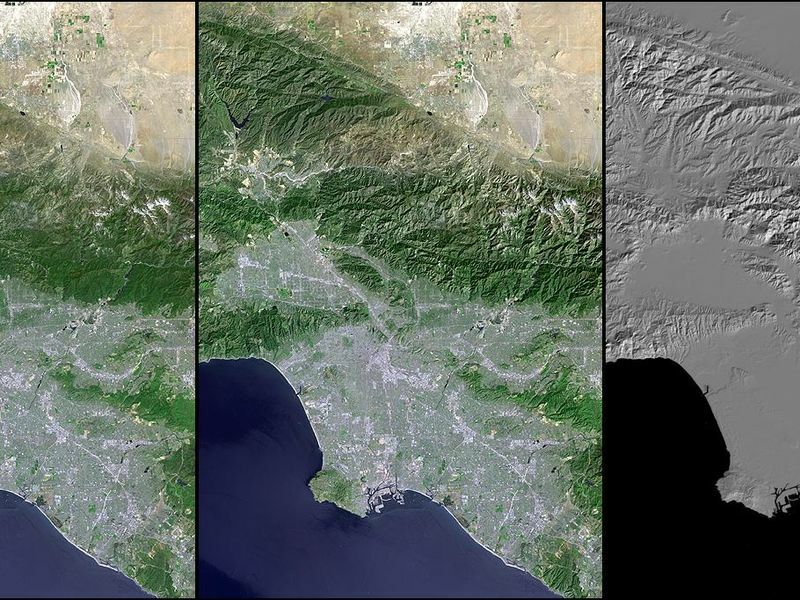 Digital elevation models (DEMs), such as those produced by the Shuttle Radar Topography Mission (SRTM), allow user-controlled visualization of the Earth's landforms that is not possible using satellite imagery alone. This three-view comparison shows Los Angeles, Calif., and vicinity, with a Landsat image (only) on the left, a shaded relief rendering of the SRTM DEM on the right, and a merge of the two data sets in the middle. Note that topographic expression in the Landsat image alone is very subtle due to the fairly high sun angle (63 degrees above the horizon) during the satellite overflight in late morning of a mid-Spring day (May 4, 2001). In contrast, computer generated topographic shading of the DEM provides a pure and bold image of topographic expression with a user specified illumination direction. 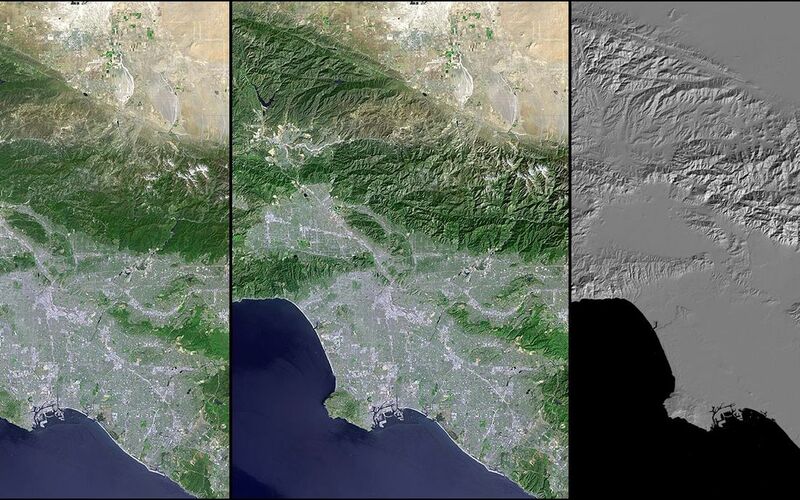 The middle image shows how combining the Landsat and DEM shaded relief can result in a topographically enhanced satellite image in which the information content of both data sets is merged into a single view. Landsat has been providing visible and infrared views of the Earth since 1972. SRTM elevation data matches the 30-meter (98-foot) resolution of most Landsat images and helps in analyzing the large and growing Landsat image archive, managed by the U.S. Geological Survey (USGS). Image Data: Landsat bands 3, 2+4, 1 as red, green, blue, respectively, with SRTM shaded relief, plus Landsat panchromatic band 8 added for detail. Original Data Resolution: SRTM 1 arc-second (30 meters or 98 feet), Landsat color 30 meters (98 feet) sharpened with Landsat panchromatic band (15 meters or 49 feet).